New components designed to optimise the car’s aerodynamic performance include a front radiator, which increases the maximum ambient temperature at which the car can run, along with a new gearbox cooler mounted on the rear Aerodeck. These features complete an aerodynamics package incorporating a new front splitter, door blade, rear wing, diffuser and louvres in the front fenders, all of which is produced entirely from carbon fibre by McLaren Racing, following design input from McLaren Automotive. The 12C GT3 is being developed by the recently established McLaren GT. 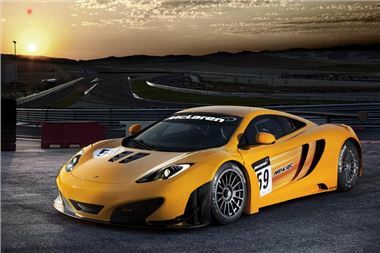 Led by McLaren Group CEO Martin Whitmarsh and CRS Racing Team Principal Andrew Kirkaldy, McLaren GT is spending the 2011 race season developing the 12C GT3 before delivering 20 cars to privateer teams for GT3 racing in Europe in 2012. Like the 12C road car, the MP4-12C GT3 features a unique one-piece carbon fibre chassis, the ‘MonoCell’. McLaren introduced a carbon fibre monocoque to Formula 1 in 1981, and the 12C GT3 will feature several other Formula 1-derived technologies. The 12C GT3 will be supplied with the same steering wheel design used by Lewis Hamilton in his MP4-24 Formula 1 car. Formula 1 suppliers past and present including Akebono, Mobil 1, McLaren Electronic Systems, Ricardo and Michelin are working with McLaren GT to create a race car specification technologically superior to the GT3 competition in 2012. Since the 12C GT3 was unveiled to the media and prospective team owners in May 2011, McLaren GT has tested its new car at a mixture of proving grounds and FIA approved circuits across Europe. This development phase is an opportunity for McLaren GT to optimise the technical specification and durability of the 12C GT3. Andrew Kirkaldy from McLaren GT said: “The reaction to the 12C GT3 at the circuits we have visited has been phenomenal. I can’t wait to see how it goes down at Goodwood this weekend. Confirmed drivers of the GT3 car for the 2011 Goodwood Festival of Speed weekend are Andrew Kirkaldy, 2010 Vodafone McLaren Mercedes test driver Oliver Turvey, and McLaren Automotive Chief Test Driver Chris Goodwin. Aerodynamics Front and rear diffuser, front splitter, dive planes and adjustable rear wing. Limited slip differential with a range of ramps and adjustable pre-load. Intake system Two water/air charge air coolers. Plastic composite plenum. Exhaust system Cast stainless steel exhaust manifold with compact MHI fixed geometry turbo chargers. 970 deg C turbine inlet temperature. Cooling Air/water heat exchangers for engine water and charge air cooling combined with water/oil heat exchangers for engine, transmission & PAS.